For assembly and disassembly of stack components. 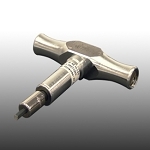 High quality cast steel with hinged pin arm to accept different diameters of tooling. Strongly recommended that you order two.